The aim of this systematic review was to evaluate the efficacy of different soft tissue augmentation/correction methods in terms of increasing the peri-implant width of keratinized mucosa (KM) and/or gain of soft tissue volume during second-stage surgery. Screening of two databases, MEDLINE (PubMed) and EMBASE (OVID), and hand search of related articles, were performed. Human studies reporting on soft tissue augmentation/correction methods around submucosally osseointegrated implants during second-stage surgery up to July 31, 2015 were considered. Quality assessment of the selected full-text articles was performed according to the Cochrane collaboration’s tool to assess the risk of bias. Overall, eight prospective studies (risk of bias: high) and two case series (risk of bias: high) were included. Depending on the surgical technique and graft material used, the enlargement of keratinized tissue (KT) ranged between −0.20 and 9.35 mm. An apically positioned partial-thickness flap/vestibuloplasty (APPTF/VP) in combination with a free gingival graft (FGG) or a xenogeneic graft material (XCM) was most effective. Applying a roll envelope flap (REF) or an APPTF in combination with a subepithelial connective tissue graft (SCTG), mean increases in soft tissue volumes of 2.41 and 3.10 mm, respectively, were achieved. Due to the heterogeneity of study designs, no meta-analysis could be performed. Within the limitations of this review, regarding the enlargement of peri-implant KT, the APPTF in the maxilla and the APPTF/VP in combination with FGG or XCM in the lower and upper jaw seem to provide acceptable outcomes. To augment peri-implant soft tissue volume REF in the maxilla or APPTF + SCTG in the lower and upper jaw appear to be reliable treatment options. The localization in the jaw and the clinical situation are crucial for the decision which second-stage procedure should be applied. 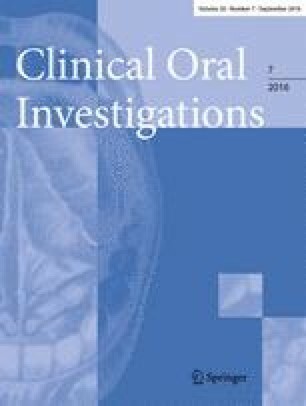 This review article was supported by the authors’ own institutions (Department of Oral & Maxillofacial Surgery of the Lucerne Cantonal Hospital and Department of Periodontology of the University of Bern, Switzerland).